Our soft play area keeps the children engaged for hours from the water slide to the space shuttle and a cool disco pen hidden under the slides! 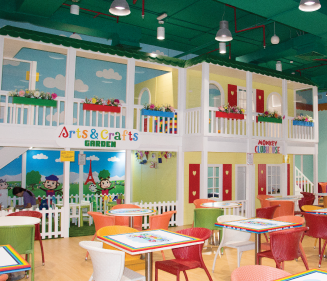 This two-story clubhouse with a play kitchen, living room and a huge toy room upstairs lets your children play house with a nearby supermarket. Children engaged for hours from the slides to the space shuttle and a cool disco pen hidden under the slides! Cheeky Monkeys received the 2018 Best Soft Play Venue award from Time Out Dubai Kids Awards held at Rixos Premium Dubai last September 26, 2018. Let Cheeky Monkeys host your kids birthday party at our indoor playground facility so you can enjoy the celebration too! Once you call to book the time, date, and a room big enough to contain the fun, we’ll make sure your party room is 100% ready—we’ll take care of the planning, games & entertainment, the set-up, the clean-up, the cake, and more so you don’t have to sweat it. We also do theme parties with advanced notice, adding the little details that help give your little royal the party of their dreams. *Rates may vary depending on offers and corporate discounts.